I have a favourite word: zeitgeist. It's German, and translates as “time spirit.” It refers to the general outlook of a period—to its obsessions and concerns, as reflected in art, literature, politics and pop culture. For example, the Beatles and Rolling Stones, the mini skirt and Mini Cooper, bright primary colours and London's Carnaby Street, all expressed something of the collective consciousness of 1960s Britain. So what does the current popularity of steampunk tell us about today's zeitgeist? I see steampunk as existing on the threshold of mystery; it is the off-balanced moment where the comprehensible teeters on the brink of the inexplicable. As a vehicle for storytelling, the steampunk ethos can be applied to any time and any place—Wild West steampunk, American Civil War steampunk, future history steampunk—but wherever and whenever you place it, its roots are set firmly in the technology, social divisions, fashions, mannerisms and culture of post 1850 Victorian England. The iconic machinery of that age was—and still is—a symbol of strength, hope and ambition. It was powering the Victorians into a bright future. For the educated classes, it promised the spread—and thus an affirmation—of their cultural values (of “civilisation”). For the working classes, it hinted at a possible future release from the backbreaking drudgery of labour—for surely machines would do all the ugly, horrible, uninteresting jobs?—freeing up time for something (anything!) else. Steam technology was not exclusive. It represented a shared vision. Every class of citizen could engage with it, because it was so blatant. The boilers and furnaces, the pipes and valves, the pistons and crankshafts, the funnels and wheels—every part of every engine was visibly working to advance the Empire to which the people belonged. The different “components” of Victorian society were similarly obvious and unambiguous. The classes were clearly divided, widely separated by income, mannerisms, leisure pursuits, dress code, and language. You could never mistake a person of one class for a person of another. Individuals knew their “place,” knew to which class they “belonged,” and knew how they fitted into, and contributed to, the vast and complex mosaic of Victorian culture. That all changed with the arrival of the internal combustion engine. As its name indicates, functional parts of the machine vanished from sight, and the engine itself became distinct from, and concealed within, the body of the contraption it powered. At the same time, machines gave rise to a new social division: the middle class. It muddled things considerably, for, as it rapidly expanded, this new economic force blurred the line between the lower and upper classes by taking on characteristics of both. An entirely new phenomenon occurred: social movement. A working class person could, conceivably go up in the world, becoming “lower middle class.” Conversely, a “toff” could fall from grace (as one side of my own family did), and plunge into the "upper middle class" category (we sank even farther). Steampunk thus references the certainties of the Victorian age in the context of what came after, when distinctions started to get fuzzy. But why has it become popular now? What is it about now that resonates with then? One of the things I really like about steampunk is that it's much more than a literary genre. There's steampunk fashion and steampunk art and steampunk music and, definitely, a hard to define steampunk personal ethos. Of these, steampunk fashion gives the biggest clue. It puts functional components back in the open. Buttons are numerous and shiny. Belts are thick and big-buckled. Cogs and pistons are in evidence. Mechanical enhancements are attached. There are goggles. However—and this is the crux of the matter— these elements have no function. They don't do anything. They are merely on display. Which brings me to my iPad. I love my iPad. I'm quite reliant on it. Yet it became obsolete practically the day I bought it. Why? Because it’s the ultimate, and perhaps the final, example of what you might term “localised tech.” It’s an object with a specific function. I believe steampunk captures the current zeitgeist because it knows that we are on a new precipice, about to tip over into a time where technology—which has already vanished from sight, stopped moving and shrunk—will also soon disappear altogether. Localised tech is on its way out. It’s going to disappear into our walls, into our furniture, into the fabric of our clothes, and, dare I say it, maybe even into our bodies. Distinct technological objects will become as quaint as steam locomotives. That’s why Steampunk celebrates blatant technology. It knows the complete opposite is on our doorstep. 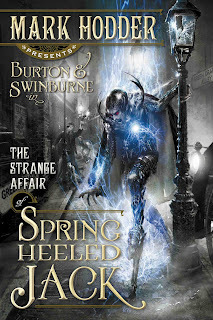 Mark Hodder is the author of THE STRANGE AFFAIR OF SPRING HEELED JACK (Pyr Books 2010) and it's sequel, THE CURIOUS CASE OF THE CLOCKWORK MAN (Pyr Books, due Spring 2011). Hodder is the creator and caretaker of the BLAKIANA Web site, which he designed to celebrate, record, and revive Sexton Blake, the most written about fictional detective in English publishing history. A former BBC writer, editor, journalist, and Web producer, Mark has worked in all the new and traditional medias and was based in London for most of his working life until 2008, when he relocated to Valencia in Spain to de-stress and write novels. He can most often be found at the base of a palm tree, hammering at a laptop. 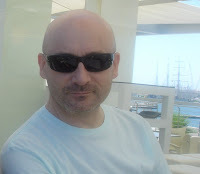 Mark has a degree in cultural studies and loves British history (1850 to 1950, in particular), good food, cutting-edge gadgets, cult TV, Tom Waits, and a vast assortment of oddities. so true. put the relevancy of steampunk into words better than i could. looking forward to reading his work. I agree, and I do think there is a bit more to it than a desire to see technology when we are at a precipice of technology becoming invisible. There is also a level of ornamentation which is missing from a lot of modern technology. Technology, as it has become smaller and more obscure, has also become less personalized and more utilitarian in appearance. Steam Punk art and fashion items typically have that level of ornamentation. I for one find that aspect rather appealing. I think another appeal of the steampunk movement is it's DIY nature. Most of today's technology relies on complicated machinery and lots of education to create. I think people are using long forgotten techniques to create things we rely on machines to make today. When you can etch an image into metal on your own with simple chemicals instead of a laser etcher or cnc machine, it creates a sense of empowerment. In a way it creates a new "middle class" between creators and consumers.